Three young welders will compete in the February SkillsUSA WorldTeam Weld Finals after advancing from the AWS/SkillsUSA US Invitational Weld Trials held in November at FABTECH 2012. The winner of the February competition will then be the final team member to be selected to represent the US in the WorldSkills Competition, held this year in Germany. The WorldSkills Competition is an international event during which students come from all around the world to compete in 45 occupational skill areas against 1000 other students representing 52 separate countries. The February Weld Finals will be hosted by Larsen Motorsports at the Daytona 500 Speedweek, and the winner will be announced Saturday, February 23. The three finalists to compete are Alex Pazkowski, Andrew Cardin, and Tanner Tipsword. They come from different parts of the country and hold different training backgrounds in welding. The trials will last 4 days and test a variety of different welds, some so precise they will have to be judged under a microscope as well as through hydrostatic pressure tests of 1000 pounds per square inch. In addition to earning a spot on the SkillsUSA WorldTeam, the finalist winner will receive a $40,000 scholarship for continued occupational training. One of the main goals of the WorldSkills Competition is to promote career and technical education (CTE). It is held every two years and test occupational skills for industries such as manufacturing, information technology, transportation, construction, and various customer services. Individual competitions are judged by industry professionals using international standards. All participants must be under the age of 23 to qualify for entry. The US WorldTeam will have a total of 20 members and compete in: Autobody Repair, Automobile Technology, Beauty Therapy, Bricklaying, Cabinetmaking, Car Painting, CNC Milling, CNC Turning, Cooking, Graphic Design, Hairdressing, IT Networks Systems Administration, Mechatronics, Plumbing & Heating, Print Media Technology, Restaurant Service, Refrigeration and Air Conditioning, and Web Design. In order for competitors to enter, SkillsUSA must raise the money for each individual’s training and travel expenses to the WorldSkills Competition. Sponsors of the event and the US World Team include the American Welding Society, tool manufacturers, electric companies, welding organizations, occupational training centers, and more. 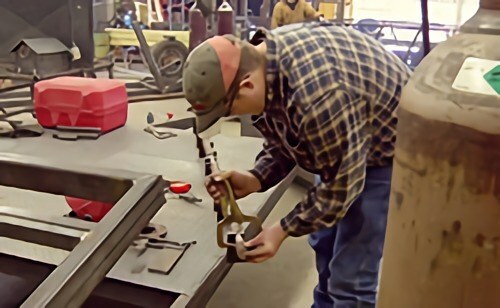 Tulsa Welding School helps students learn pipefitting, ship fitting, and welding in OK and FL. Students in Tulsa can even train for the Associate of Occupational Studies in Welding Technology program in just over 15 months. To find out more about Tulsa, Oklahoma or Jacksonville, FL welder courses, contact TWS today.